A weather warning attached to Storm Abigail, the first storm to be officially named by the Met Office, has been upgraded from yellow to amber. 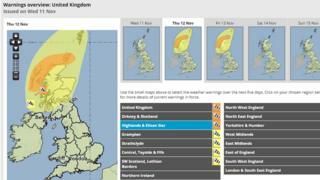 The amber "be prepared" warning covers the Western Isles, parts of Argyll and the north west Highlands and Orkney. A yellow "be aware" issued on Tuesday has also been updated and extended to cover the rest of Scotland. The yellow warning covers from 18:00 on Thursday to 14:00 Friday and the amber from 21:00 on Thursday to midday on Friday. It warns of gusts of up to 70mph, and possibly 90mph in exposed places. Rain and lightning have also been forecast for the next two days. Ferry operator Caledonian MacBrayne said all Thursday's Mallaig to Armadale sailings have been cancelled and other services could be disrupted because of the expected high winds. Drew Collier, Calmac's operations director, said: "There is clear warning that major weather related disruption to ferry services on the Clyde and Hebrides routes is likely later this week so I would urge people to factor this in when making travel plans. "The sea conditions we are expecting could well be too treacherous to sail in." Police Scotland said people in the worst affected areas should expect the likelihood of power cuts and disruption to travel. The force said: "In addition to the high winds and lightning, there are warnings of large waves which may lead to overtopping along costal routes and causeways. "There is a strong possibility of disruption to public transport and power utilities. "Members of the public, businesses and communities are advised to plan ahead and prepare for possible power outages ahead of the storm. "Where possible, secure outdoor items which could be dangerous in the wind. It is also asked that communities look out for vulnerable neighbours." Earlier this year the Met Office asked the public for suggestions for names for storms. Abigail is the first storm to be officially named by the weather forecasting organisation.